Demonstration model for showing how refrigerators and electrical compression heat pumps work. Consisting of compressor with drive motor, vaporizer, expansion valve, and condenser. May be used as an air-water or water-water heat pump. 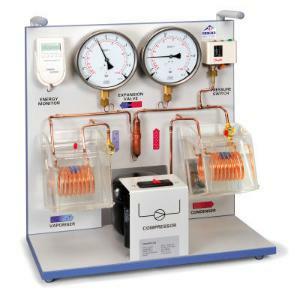 Includes wattmeter (for recording the operation time, the mains voltage, instantaneous power input, electrical work) and two thermometers for measuring the temperatures in the two reservoirs. The components are connected in a closed system by copper pipes and mounted on a base board, and the clear layout makes it possible to directly relate the sequence of changes of state to the cyclic operation of the heat pump. Evaporator and condenser are constructed as copper tubing spirals and each of them is submerged in water-filled containers serving as heat reservoirs for determining the heat absorbed or emitted. Two large manometers display the pressure ratios of the coolant in both heat exchangers. Two observation windows are provided for observing the state of aggregation of the refrigerant after the evaporator and after the condenser. A protective overpressure switch disconnects the compressor motor from the circuit when overpressure reaches 15 bars.